Dear President Trump, Thank you for declaring opiate use, which kill more than 100 people a day, a public health emergency. You’re getting some backlash about there only being $57,000 in the Public Health Emergency Fund, and that you’re letting down those who voted for you and counted on your promise to help them….Well, here’s your solution! Members of Congress are trying to get information to you, including an Oregon congressman who passed out a pamphlet entitled “Physician Guide to Cannabis-Assisted Opioid Reduction,” which cites 16 published studies outlining how cannabis can reduce opioid consumption, tolerance and overdose mortality. 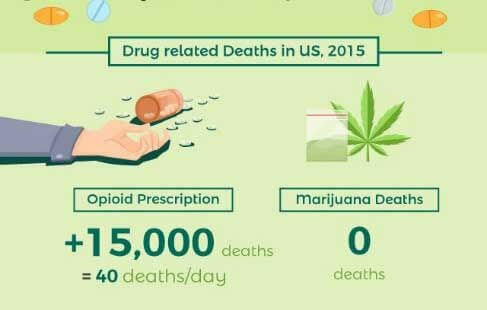 While opiates are killing 175 Americans a day, there has never, in the thousands of years of history of humans using cannabis, NEVER one death attributed to a cannabis overdose. We are being prescribed medications even if they do not genetically work on us! Tramadol (as well as several other pharmaceutical drugs including Codeine, Prozac, Zoloft, and antipsychotic drugs) genetically don’t even work on an estimated 7 to 10 per cent of the population!! How many people are taking medications for pain, depression or even mental illness with no clue that their body is not responding to them? Recently, one billionaire pharmaceutical CEO arrested and charged with fraud and racketeering for offering bribes to doctors to prescribe their opiate, meant only for cancer patients with severe pain, to large numbers of people who did not have cancer. This is the same company that donated at least one third of all the money raised in opposition of Arizona’s cannabis legalization. Former DEA division chief Joe Rannazzisi was the frontman in the government’s war against opioid abuse for more than a decade, until he was pushed out by members of Congress and an industry campaign that he says has resulted in a weakening of the nation’s drug laws at a time of unprecedented crisis. He is a consultant for a team of lawyers suing the opioid industry. Separately, 41 state attorneys general have banded together to investigate the industry. Hundreds of counties, cities and towns also are suing. Mr. Trump, at the very least, please be aware of and support the bi-partisan Medical Marijuana Research Act of 2017 which aims to “make marijuana accessible for use by qualified marijuana researchers for medical purposes.” It can provide the first step to resolving lingering questions about the potential of medical marijuana. August 2018 Update: WHO had declared CBD safe and medically effective and will be taking a deep look into removing the cannabis from international control in November.